The Delius Association of Florida, Inc.
"The Influence of African-American Music on the Works of Frederick Delius"
'Autobiography of an Ex-Colored Man'"
"What Delius Means To Me - A Composer's View"
"The Delius Festival: Some Personal Recollections"
Irmelin Prelude (Michael Dell, organ) Helen Faulkner: "Delius Trust Update"
Past Presidents: "Memories of Past Festivals"
"Delius in the Life and Career of a Conductor"
"Delius: An End of Century Perspective"
(1/17/97) La Calinda (JSO, Kevin Rhodes, cond.) Felix Aprahamian: "Personal Memories of Delius"
"Peter Warlock: The Man and His Music"
Jack Turnock: "Gauguin, Friend of Delius"
pamphlet "A Visit to Grez"
Caprice and Elegy (Linda Minke, cello; Gavin Taylor, piano); Florida Suite (2 movements); La Calinda (Mary Watanabe, piano); Intermezzo from Fennimore and Gerda (Lorraine Roettges, flute; Sally Heffelfinger, oboe; Gavin Taylor, piano) Jack Turnock: "Delius' Florida: The Painting of Herzog and Homer"
Rodney Meadows: " A Short History of the Delius Society in Great Britain"
front back "Discovering Delius" 2 Early Partsongs; Chorus from Act I of Irmelin; Final Chorus from Appalachia; Choruses from Hassan (Solano Singers, Brenda McNeiland, cond.) Robert Threlfall: "The Collected Edition: An Informal Introduction" and "Delius' Musical Apprenticeship"
"Delius, Norman O'Neill and the Frankfurt Group"
"Delius - Instant History, 1961"
"Thomas F. Ward - Delius' American Teacher"
"Through Norway in Delius' Footsteps"
To Be Sung of a Summer Night on the Water; The Splendour Falls on Castle Walls (The Solano Singers, Brenda McNeiland, cond.) 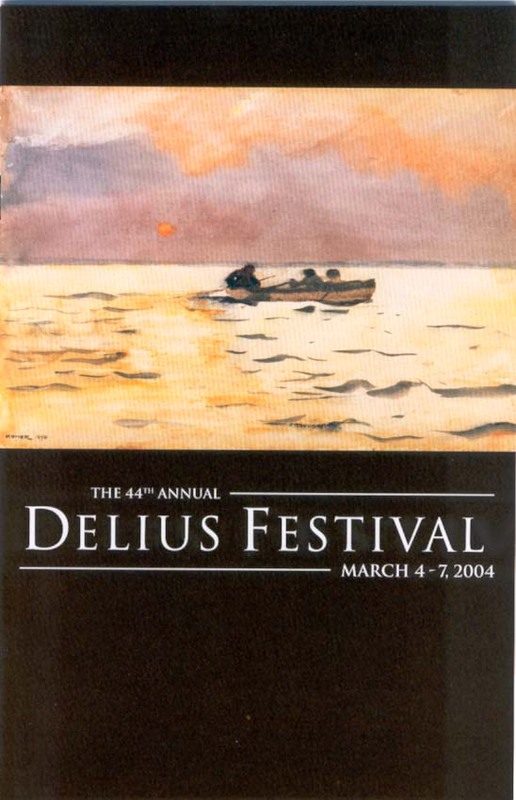 Rachel Lowe: "In Search of Delius"
Dance from North Country Sketches; Song Before Sunrise; Fantastic Dance (Joanne Rogers and Jeannine Morrison, pianists) Joseph Jeffers Dodge: "Delius and the Art of his Time"
(3/15/84) Irmelin Prelude (JSO, Adrian Gnam, cond.) Uta von Delius: "Frederick Delius and Jelka Rosen: A Study in Geneology"
(1/20/83) Over the Hills and Far Away (JSO, Ransom Wilson, cond.) John Canarina: "The Legacy: Fenby and Others"
(7/28/82) Appalachia; Walk to the Paradise Garden (London Symphony Orchestra, Eric Fenby, cond. ; Solano Singers, Brenda McNeiland, cond.) Lionel Carley: "Scandal in Christiania: Delius and Folkeraadet"
(2/23/81) La Calinda (JSO, Willis Page, cond.) "An Afternoon with Eric Fenby"
Sea Drift (John Shirley-Quirk, baritone; JSO, JU Concert Choir, Willis Page, cond.) Eric Fenby, Robert Threlfall, John Shirley- Quirk, Jeff Driggers: "Sea Drift Symposium"
Piano Pieces (Eugene Hudson, piano) Robert Threlfall: "The Early Versions of Delius' Piano Concerto"; "My Work with the Delius Trust" and "Delius' Unknown Opera: The Magic Fountain"
(1/23/78) On Hearing the First Cuckoo in Spring (JSO, Willis Page, cond.) Jeff Driggers: "Hassan, or the Golden Journey to Samarkand"
Eric Fenby: "The Life and Music of Delius"
Violin Sonata No. 3 (A. Krosnick, violin; M. Krosnick, piano) Dr. Lionel Carley:"Delius before Beecham"; "Delius and Grainger Correspondence""Tracking Down Delius in Paris and Grez"
Dr. Joseph Brennan: "Delius and Whitman"
Ralph Stang: "Delius: The Solitary Singer"
Stewart Manville: "Percy Grainger's Work on Behalf of Delius"
Dance Rhapsody No. 2 (Jacksonville Symphony Orchestra, T. Scherman, cond.) Frances Kinne: "Koanga"
Rev. Charles McGehee: "The Pantheism of Frederick Delius"
Songs (Seth Lubin, baritone; Patricia Gerringer, soprano; Gustavo Halley, bass; Roberta Merrill, soprano; Edward Bryan, piano) Gloria Jahoda: "The Real Frederick Delius"
Jeff Driggers: "Frederick Delius and His Music"and "Frederick Delius: A Study in Style"
Rev. Charles McGehee: "The Religion of Delius"
Edward Bryan: "The Songs of Delius: A Comparative Study"
La Calinda; On Hearing the First Cuckoo in Spring; Fantastic Dance (Grace and Harold Sanford, pianists) Joe Evan Burt: "Delius: A Critical Comparison With His Contemporaries"
"Delius and Sir Thomas Beecham"
Three Preludes; Dance for Harpsichord (Mary Lou Krosnick, piano) Mrs. E. Ross Harris: "The Influence of Florida on the Music of Frederick Delius"
Gloria Jahoda: "Delius: A New Look"
Midsummer Song; The Streamlet's Slumber Song; Wedding Song from Village Romeo (R. E. Lee H.S. Chorus, Willis Johnson, cond., Janelle Ganey, piano) Jeff Driggers: "A Portrait of Delius"
Joseph Manucy: "Delius As Fenby Knew Him"
Two Aquarelles; Midsummer Song; The Splendor Falls on Castle Walls; Wedding Music from Village Romeo; Closing Scene from KOANGA (JU Singers, Bryan) Eric Fenby: "F. Delius: Personal Recollections of My Years at Grez-sur-Loing" and "The Music of Frederick Delius"
Piano Concerto (Gerson Yessin, piano; William Hoskins, organ) Mrs. E. Ross Harris: "The Life of Frederick Delius"
Hugh Alderman "Delius is Honored in England and Florida (The Delius Centennial 1862-1962)"
Hugh Alderman, Edward Bryan, William Hoskins, Arthur Kraft: "Symposium on Frederick Delius"
Mary B. Graff: "The English Settlement of Picolata"
Frances Kinne: "Culture and Jacksonville"
Hugh Alderman: "Florida in the Life and Music of Frederick Delius"